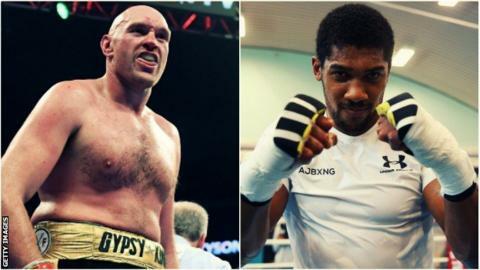 Tyson Fury is now a bigger draw than fellow British heavyweight Anthony Joshua, says promoter Frank Warren. Unbeaten Fury, 30, could face WBC champion Deontay Wilder in a rematch within the next three months after their controversial draw in December. And Warren believes his fighter – who has recovered from drug and mental health issues – holds more appeal than IBF, WBA and WBO champion Joshua, 29. “He’s the people’s champion,” Warren told BBC Sport. Fury survived two knockdowns, including a remarkable recovery in the 12th round when he looked beaten against American Wilder and many observers felt he had done enough to claim a surprise victory. The self-styled ‘Gypsy King’ has attracted criticism in the past for homophobic and sexist comments, and accepted a backdated two-year doping ban. He tested positive for a banned steroid in February 2015, and blamed the result on eating uncastrated wild boar. But Fury has won admirers with his openness about his mental health issues and Warren says his ‘man of the people’ approach was gaining new supporters as he prepares to fight again in March or April. “There’s no corporate element with him. You don’t have to go through 100 people. You just pick the phone up. He walks down the street and he hasn’t got an entourage of minders,” said Warren. “Whoever he fights next, if Tyson Fury fights in this country, it is going to be a sell-out, wherever he fights. Will we see Fury v Joshua? “I loved Joshua as an amateur. I really liked watching him – a young guy, exciting and he seems to have reached a certain point in his career now where you can see what the flaws are,” said Warren. “He’s vulnerable, he’s wobbled in most of his fights. Warren was disappointed Fury did not make the six-strong shortlist for the 2018 BBC Sports Personality of the Year award and was beaten to the Greatest Sporting Moment honour by England’s victorious Commonwealth Games netball team. He believes Fury is in the process of rebuilding his public image as others have done in the past. “You know Muhammad Ali was voted Sports Personality of the Century years ago – the most loved sportsman of my lifetime,” he said. “He’s the guy, when I was a kid – and I remember him – my late dad and many of his generation hated him when he said things like the white man’s the devil, blacks shouldn’t marry whites. “He was forgiven for that. He came back and he became a humanitarian, talked about the love of the people and united people. Q: Where and when would you see a potential Fury-Joshua fight taking place? A: In the UK. You could go to Cardiff, they have a roof on the stadium. That should be summer, outdoors at a football stadium and would sell it out 10 times over. A: It would grip the country – one of those events that transcends the back pages. Everybody would be talking about it. Q: If you can sell it 10 times over, won’t some fight fans be priced out of tickets? A: It will be a pay-per-view event because the fighters will want to maximise their income, you can understand that. It’s very easy this fight. When I say 50/50, let Sky and BT Sport Box Office both have it. Take all the obstacles away like they do in the States. The fans want the fight. If both TV channels are showing it, that means the boxers’ incomes are going to be more. It’s a no-brainer. A: Anthony Joshua is a business. He makes money. It doesn’t matter who he fights, they can fill up Wembley. They have a seven-year business plan, which is filling up Wembley twice a year and it’s a cash cow. I get that – Barry is an accountant by trade. That’s not what the fans want.